We are excited to announce that AALF is now a part of TakingITGlobal, one of the world's leading networks of young people learning about, engaging with, and working towards tackling global challenges. For more information, check out TakingITGlobal. NEW TO 1:1? REVITALIZING YOUR 1:1 INITIATIVE? 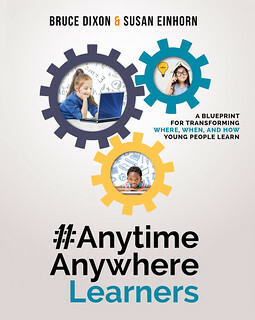 Not a checklist or set of instructions for an easy-to-assemble, 21st century school, the #AnytimeAnywhereLearners guide lays out a road map designed to help you, as district or school leader, determine what you need to know and do at each step of your 1:1 planning and development process. Written by Bruce Dixon, President and Co-founder of the Anytime Anywhere Learning Foundation(AALF), and Susan Einhorn, AALF Executive Director, this in depth guide, with links to hundreds of additional resources, will help you make critical decisions, know the strategic questions to ask, understand what will be required of district personnel and school leadership, and have realistic expectations about what the outcomes will be. Check out this review by Aaron Davis. Available in print and Kindle versions from Amazon. -- We always mention the importance of a meaningful, clearly understood vision as well as the mission statement that encapsulates how you'll achieve it. But too many of these statements are a collection of buzzwords with little or no shared understanding or consideration around what these words mean. In a provocative article, Scott McLeod writes that many mission statements claim to be helping students become self-motivated learners, but few really create a learning environment that supports the development of intrinsic motivation or even discuss what that would entail. Check it out at The fiction of most school mission statements. 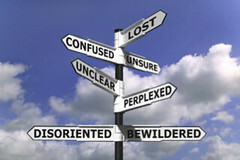 -- Are schools an example of "trying to do the wrong thing right?" Will Richardson addresses this question, the implications of following this path, and how and why schools need to change. If you have time to read only one article today, this is the one to read - We're Trying To Do "The Wrong Thing Right" in Schools, and check out this video interview of Russell Ackoff, author of Turning Learning Right Side Up: Putting Education Back on Track (paperback). -- How do people learn? Are your teaching practices designed to support learning in the way your students learn? Have you asked yourself these questions? To see how one school approached these questions, start by reading 21 Steps to 21st Century Learning: Learning and Teaching at Princes Hill Primary School. Then, you may want to check out this book by Susan Blum entitled "I Love Learning; I Hate School" to see what one university professor learned when she asked herself these questions. -- Over the last few years, AALF has been quietly working with 1:1 schools and school districts who are looking to see if they are on track and meeting their goals. Click here to read about AALF 1:1 Audit and Review Services and how it can support your work. -- Check out Reflections on Mathematical Thinking From a (Formerly) Math-Averse Art Historian about some of the artificial roadblocks we set up in education and how one person overcame them. -- We're pleased to announce The End of School As We Know It a new book by AALF President Bruce Dixon. In it, the author challenges school administrators and leaders to let go of their assumptions about the relevance of traditional schooling in learners' lives and critically reevaluate the effectiveness of their current methods. This book is an essential starting point for school leaders who recognize the need to re-imagine school for today's learners. -- AALF's Integrated Learning Support Services Click here to read more about our unique learning support services, and how they can assist you in your 1:1 journey! -- For some great reads on education, technology, and creativity have a look at our AALF Bookstore where you'll find a collection of fantastic titles sure to inspire! CHECK OUT AALF's FACEBOOK PAGE! As part of the process of revising the 21 Steps to 21st Century Learning framework, Susan Einhorn, AALF Executive Director, visited Carolyn Thompson, teacher of History, Government, and Geography at McGehee School for Girls in New Orleans, Louisiana, and asked her how 1:1 technology has changed her teaching practices. She shared some powerful insights on the manner in which 1:1 allows educators to build a community of young scholars in their classrooms. Click here to learn more! We hear it all the time now. Students must collaborate. It is a 21st century skill! But, what is the deeper, fundamental meaning behind this phrase? In this article, Peter Skillen, Manager of Professional Learning for Social Media with the YMCA of Greater Toronto discusses the issue of collaboration, and explores how it can contribute to the sharing and building of knowledge. Click here to read more on student collaboration! Over 100 questions parents frequently ask about 1:1. These are questions for which you may want to prepare answers before laptops are deployed.. There aren't any members online.